Note: All the command names are also valid if you replace the prefix "SPM" for "SPATIALMANAGER". 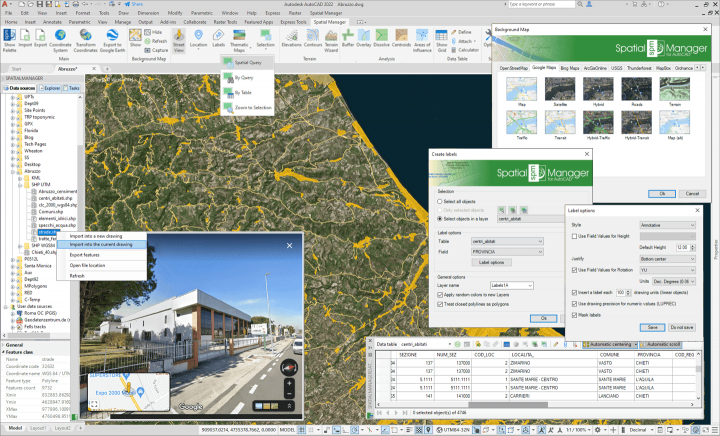 For example, "SPATIALMANAGERCREATEKML" is equivalent to "SPMCREATEKML", or "SPATIALMANAGER" is equivalent to "SPM"
Transformation of coordinates when importing, exporting, showing Background Maps, etc. Direct export to CSV, TXT, etc. Also shows some other data as the Blocks properties (Name and Attributes), Layer, geometric properties, etc. This page was last modified on 30 August 2018, at 15:31. This page has been accessed 257,482 times.